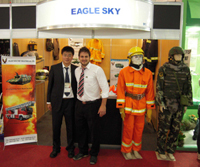 DES was just back from a safety and fire products trade show hold in Sao Paulo, Brazil on Sept.4. FISP is the largest safety and firefighting equipments show in South America. It was held from Aug.27-29, 2008. In the fair, DES exhibit its various firefighting and military protection equipments such as firefighter personal protection equipments, firefighting tanks and engines, ballistic helmets & vests, military trucks and trailers, etc. DES aims to expend its market in South America and supply quality safety products for customers from this region.